We hear it all the time from people “follow your dream and the success will follow”. It’s pretty easy to say “follow your dream and success will follow” but in reality it is tough to do. Success only appears to be a simple path. One of the most important components for success is hard work. Hard work is what defines people who are successful above all else, without hard work you may be just clarifying goals or objectives, but to achieve them you need to work hard in a direction that will allow you to follow your dreams. 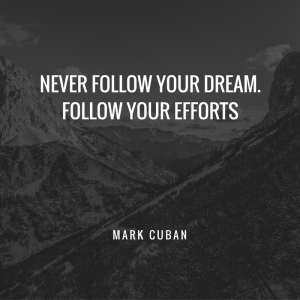 Mark Cuban stated : Don’t just follow your passion, follow your effort. It will lead you to your passion and to success, however you define it. When you are good at something, are passionate about it and work even harder to excel and be the best at it, good things happen. Let’s look at the other side of the coin too. A drawback of following your dreams is that it can make people needlessly limit their options. For example if you’ve interest in literature, it’s easy to think you must become a writer to have a satisfying career, and ignore other options. Just because you’re passionate about something doesn’t necessarily mean you’re good at it or that it’s a viable path towards creating a career. So, follow your dreams? Yes for sure. But don’t chase your dream blindly. Make it a calculated chase, take calculated risks, plan to have suitable backups, don’t get wedded to your dreams endlessly. Know when to stop. ← What does Peace mean to you?